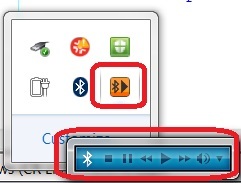 What is the "Audio/Video Remote Control" "Bluetooth Service View" program on Windows 7? "Audio/Video Remote Control" is a user interface provided by the "Bluetooth Service View" program on Windows 7 to control your iPhone remotely over the Bluetooth connection. "Bluetooth Service View" program runs automatically on your Windows 7 computer after you finish the Bluetooth connection with your iPhone. "Bluetooth Service View" program displays a taskbar tray icon. If you click on the tray icon, you see the "Audio/Video Remote Control" interface. If you play any audio or video on your iPhone, your Windows 7 computer speaker will be used. And you can pause and resume the play, or increase and decrease the volume on your computer.